On the following 8 male and 10 female stills images from the videos both the laryngeal gestures and the waveform in Neutral with air are seen. 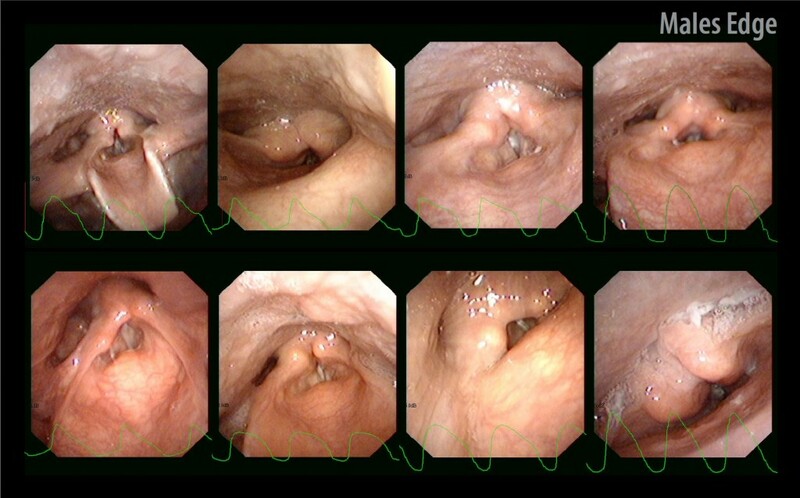 The stills are extracted from the videos from the endoscopy study performed by Julian McGlashan and Cathrine Sadolin at CVI in Copenhagen in June 2007. The stills are extracted from the videos in the manner previously described. (See Laryngeal recognition in Edge). In Edge the opening of the larynx is even more narrowed, and the cuneiforms are rolled in even more than in Overdrive. This makes it hard to see the vocal folds. The narrowing creates an even flatter angle between the arytenoids and the aryepiglottic fold and also an even more acute angle between the aryepiglottic fold and epiglottis. The piriform fossae and area between the back wall (posterior pharyngeal wall) and the larynx becomes very small and is often closed off altogether. The larynx is raised to a higher position (you can see that it gets closer to the camera). 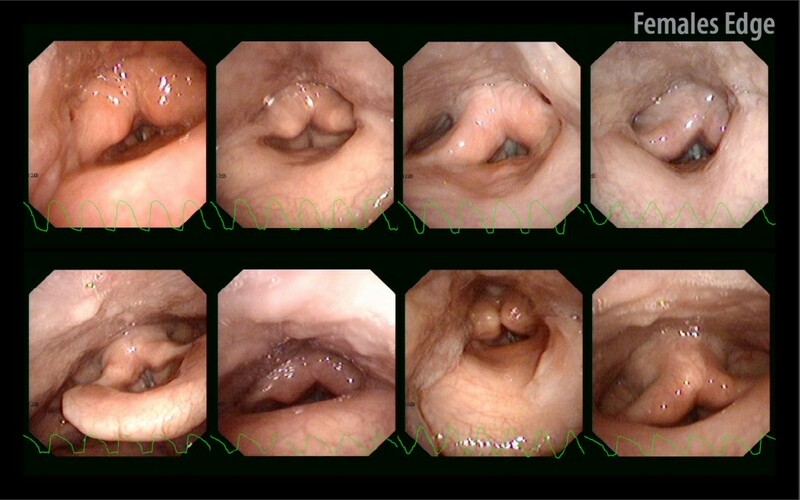 The Laryngeal gestures and the laryngograph waveform are more to be seen as patterns of progression from mode to mode, rather than absolutes. The larynx, the laryngeal gestures and the waveforms often differ from singer to singer, some singers have really weird waveforms, but still the patterns often show similar features. The progressive change in the patterns can be used as a guideline on how to identify the modes for an individual singer.